Field of Oceanography is best career option for the people having interest in the study of ocean and its surrounding environment. Want to know about jobs, career scope and salary offered in the field of oceanography? Get complete guide about how to start career as oceanographer. Let us start with…What is Oceanography? In simple words, Oceanography is the “study of oceans”. Study of ocean is divided into four branches namely biological oceanography (marine biology), chemical oceanography (marine chemistry), physical oceanography (marine physics) and geological oceanography (marine geology). Oceanographers are the scientist who studies the ocean. Oceanographers are involved in mineral exploitation, shipping, fisheries, coastal construction, weather prediction and climate change. The need of study of various oceans is present in our world that is why the demand of oceanographers is increasing day after day. The oceanographers study the ocean waters and their effects on sea life, the weather and many others. The oceanographers can work in the fields ranging from conservation to the oil industry. Job duties vary depending on the specialization in this field of courses. A good place for an eligible oceanographer is to start from bachelor’s degree and relevant work experience in particular. The demand for jobs arises from the need for environmental protection and water management. Get Latest Career Notification about Oceanography Courses, through SMS or E-mail by entering your details below. For PG Courses: Candidates who have passed B.Sc. either in Zoology/Botany/Chemistry/Fishery Science/Earth Science/Physics/Agriculture/Microbiology/Applied Sciences or in other equivalent field are eligible to pursue M.Sc course in oceanography. Minimum educational eligibility for admission to M.Tech programme is B. Tech or equivalent degree/AMIE (Associate Member of Institution of Engineer) in Civil Engineering/ Environmental Sciences with 60% marks. Those holding M.Sc degree in the relevant field are also eligible. For Doctoral Courses: To pursue Ph.D./M.Phil in oceanography, you must have the postgraduate degree in related field. Most of the Universities/institution provides admission through entrance test. Candidates want to pursue M.Tech in oceanography have to appear the Graduate Aptitude Test in Engineering (GATE 2019). Various institutions conduct conducts separate entrance exam for admitting students to its Ph.D. course. The job of an oceanographer is generally research-oriented. 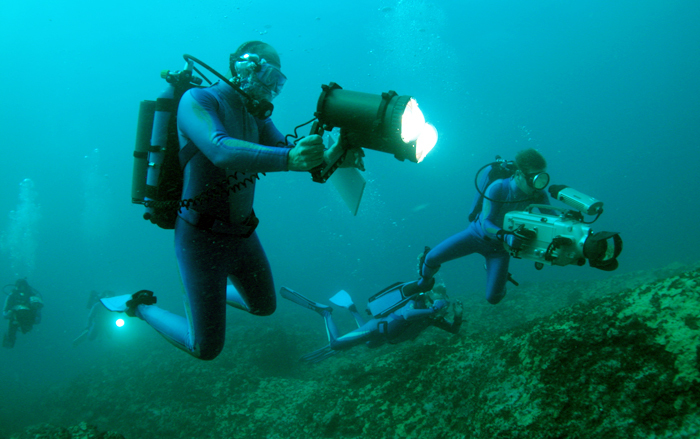 They conduct surveys, collect samples and analyze data in the sea. Job opportunities are extensive for the professionals working in this field. Jobs for oceanographers are available in both public and private sector. Depending on the ability and knowledge, professionals of this field can join as scientist, engineer, and technician. One can also get the job in government sector organizations like Geological Survey of India, Meteorological Survey of India, Department of Oceanography, etc. After getting the complete degree, you can get employment in the public sector, private sector and various governmental as a scientist, engineer or a technician. In public sector, candidates can avail career opportunities in Oil India also. Aspirants can find the employment in the government sector like the Geological Survey of India, Meteorological Survey of India, Department of Oceanography etc. You can go for research studies in various colleges and research centers. It also provides many job options for research. Candidates can also choose teaching profession in most of the reputed colleges or universities. Excellent scientific and mathematical skills. You should have the knowledge of different oceans of different area. Good Practical and problem-solving skills. Research skills are essential to you so, that you can research about whole properties of the particular ocean. Observational skills must be good. The communication skill is must in you and the complete knowledge of computer applications like digital mapping, remote sensing, and computer modeling. Good knowledge in the subject of the marine environment is required. The written skills are very necessary when it comes to publishing specific findings. The career path in teaching field is also available for the candidates holding master or Ph.D. degree in oceanography. Oceanographers can also move abroad. In United Kingdom (UK), they will get the highly paid job. To collect data for future records. Test theory and further develop it. Prepare papers and reports on the basis of findings. Make policies on coastal and marine resources and environments. How much an oceanographer earns? In India, the salary of oceanographer starts from Rs 20,000 to 30,000 per month. You will get the Salary depending upon experience and area you are specialized in. Foreign countries like UK, US, France offers good salary package to oceanographers. Their remuneration is around $50,000 to $80,000 per year in abroad. For more information about Career In Oceanography, you may ask us by commenting below. After graduating with bsc honrs in chem or zoology how can i get admitted in aana unviversity of chennai for msc in oceanography? I am graduated in Civil Engineering.Am I eligible to study for oceanography? Please reply me. Hlw sir, I am saheli.I recently completed my graduation in physics…but I secured only 52.5 marks.Though in secondary and higher secondary examination I got above 90% marks. so am I eligible to do this course(marine physist).plz reply sir. Hlw sir, I am saheli.I recently completed my graduation in physics…but I secured only 52.5 marks.Though in secondary and higher secondary examination I got above 90% marks. so am I eligible to do this course(marine physist).plz reply. Sr i am a +2 biology science student and I am really interested in oceanography so how can I achieve my goal? MUCH SO , I WILL BE OCENOLOGIST IN FUTURE. THANKU FOR READING MY COMMENT. Its is a very good information . thank you so much. I am graduated in Instrumentation engg and want to apply for oceanography.Please comment whether I am eligible for studying oceanography. I have completed B.sc in biochemistry and i am highly interested in this subject. Am i eligible to study oceanography? If I’ve finished Bsc advanced zoology & biotechnology .. Am I eligible for Msc oceanography..
Hi, My name is Raghunath and i am graduated in ECE and i am highly interested in Oceanography.I need a suggestion regarding whether i am eligible for studying oceanography or not for the above field.